Old flight of stairs in Taal, Batangas. Image source: Facts and Figures about the Philippines. 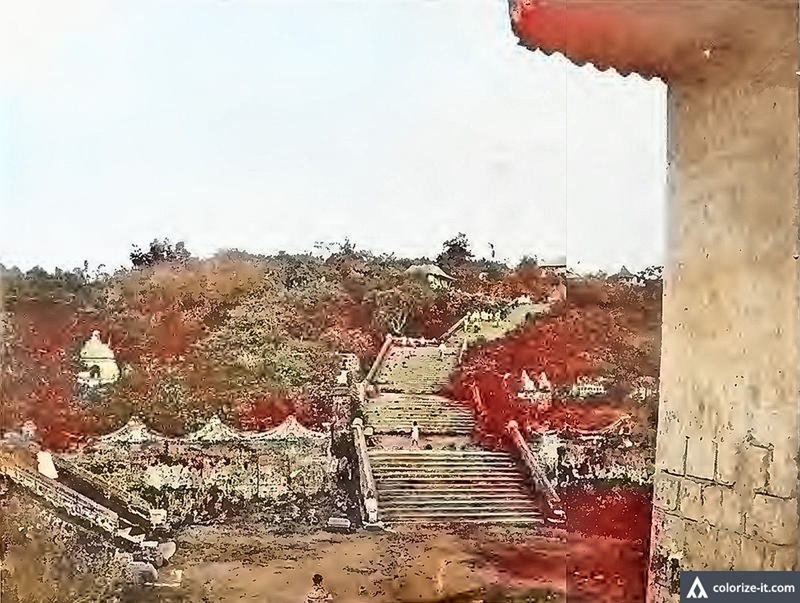 The photograph above has been taken from the 1920 publication “Facts and Figures about the Philippines” where it is simply titled “Old Flight of Steps in Taal.” The flight of steps exists till the present day albeit understandably vastly changed from when the picture was taken, with both flanks filled with houses. The picture has been processed using graphics editing software to improve overall quality and then colorized courtesy of Algorithmia. The publication has been downloaded from Archive.org where it has been made available by the University of California at Los Angeles for researchers. The copy was donated to UCLA by one Clark J. Milliron. Below is the original black and white extract. The original black and white extract of the top photo.